Dont miss an opportunity to participate in the conservation of Marine Turtles by assisting in the release of newly hatched turtles into the wild. You will be charmed by these small newborn reptiles as they scramble across the beach to the lapping waves at the shoreline of the Sea of Cortez. The scene of dozens of these tiny travelers beginning their life will warm your heart. Turtle releases are great interactive activities for children; not only will the kids be engaged with the cute turtles, but they will be learning about the importance of ecological conservation. If they loved the sea turtle characters, Crush and his son Squirt, in the childrens animated movie Finding Nemo, they will love meeting the real life versions. After participating in a turtle release program, you may have some budding marine biologists on your hands. 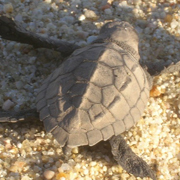 So, do not hesitate to bring the entire family along on our Turtle Release tours. Visitors to our turtle hatchery compound will learn all about these fascinating aquatic reptiles including diet, mating, anatomy, migration patterns, evolutionary history, predators, and marine habitat. You will be made aware of the escalating pressures on the survival of these ancient reptiles. We are completely committed to the conservation of this endangered species. Our research campuses near Cabo San Lucas were not only founded to assist this species in its comeback, but also to raise the awareness of vacationing tourists about this highly threatened species. If you are a wildlife enthusiast, our Sea Turtle Release tour is the perfect eco-excursion for you. The whole family will enjoy touring our Los Cabos turtle preservation facility and hatchery. If you are looking for a fun-filled day in the Cabo San Lucas sun, look no further than our fantastic Cabo Escape Fun Day, a raucous cruise that departs from Cabo Marina for Chileno Bay, a gorgeous cove with a sugary beach and an amazing coral reef.